Adrian Grenier Takes Part in Good Deeds Day 2016! 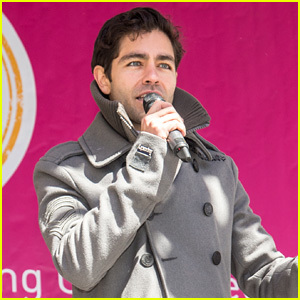 Adrian Grenier speaks on stage at the 10th anniversary of Day of Doing Good held at Herald Square on Sunday (April 10) in New York City. Good Deeds Day is an annual celebration that unites countries all over the world to do good deeds together. Karlie Kloss Reveals Her Best Beauty Hack on 'Late Late Show' – Watch Here! Do Women Really Spend More Than Men? Tupac Movie — 'Notorious' Star Resurrects B.I.G. Al Franken Receives Letter Of Support From Dozens Of Women Who Worked On SNL Amid Sexual Misconduct Allegations! Chris Brown Gets Emotional Talking Rihanna Assault in Docu Trailer: "I Felt Like a Monster"
YES! Christina Aguilera May Soon Be Dropping Her Next Single! DEETS HERE! THIS Is Why Amber Rose Defended Kim Kardashian's Naked Selfie! WATCH HERE! April the Giraffe's Calf Finally Has a Name — Find Out What It Is!